This box allows you to control how you want your Broker Brain public website to function. Here, you can indicate the number of properties that will display per page, type in messages that will appear on the website, assign site passwords, and much more. 1. From the Admin tab, click the Site Settings sub tab on the left-hand side of the screen. Click the Public Site sub tab (at right). Maximum number of properties allowed to display as a result of a search on public portal (0-no limit) - As indicated, this field allows you to adjust the maximum number of properties displayed on your public website following a search. 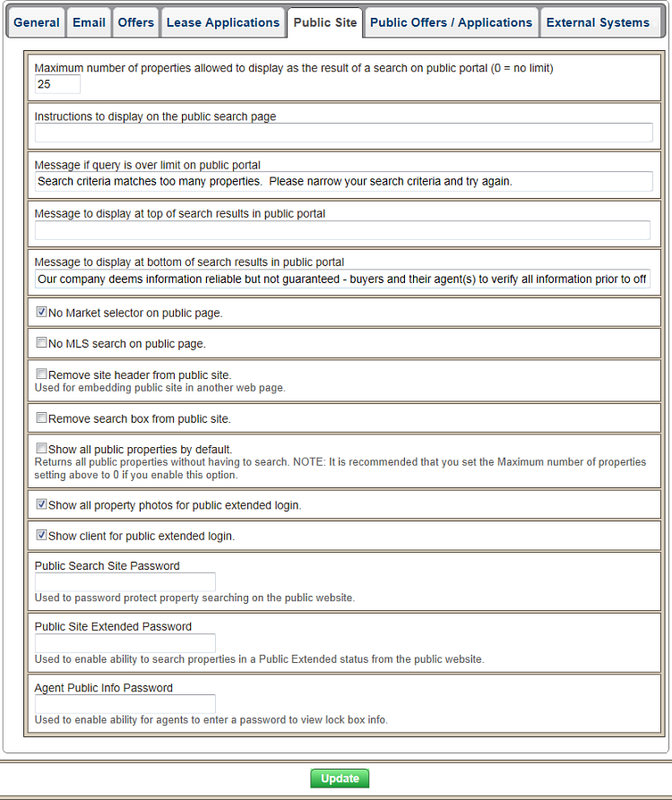 Message to display at top of search results in public portal - This field allows you to type in the message that appears above the search results on your public website. The message you type in will display as shown in the screen shot below. If you leave this field blank, no message will appear. Message to display at bottom of search results in public portal - This allows you to change the message that appears at the bottom of your search results, as shown circled below. No MLS search on public page - If you do not wish properties to be searchable by MLS number, you may remove that capability by checking this box. Remove site header from public site - If this box is checked, the company header information will be gone, allowing you to imbed public web site info into another web page. Remove search box from public site - Enabling this feature will have the effect of no longer displaying the property search box on the public site. Checking this box alone will make your website unusable. However, if checked in conjunction with Show all public properties by default, your site will display a list of all your public properties each time anyone logs in, without the search box showing at the top of the screen (be sure to read Show all public properties by default shown next for important information). Show all public properties by default - Enable this field if you wish to show a list of all public properties each time someone logs in to the public site. Important: In order for this feature to work properly, you must set the Maximum number of properties allowed to display field to zero. Show all property photos for public extended login - When you upload photos into Broker Brain, you will indicate at that time if they are meant for viewing on the public site. Only photos marked as public images can be seen. When you enable the Show all property photos for public extended login feature, all photos are viewable on the website to any user who logs in with the public extended password. Show client for public extended login - If you enable this check box, the client will display for any property in a status that is marked as public extended under Admin>Statuses>Property, as long as the user provides the public extended password (See Public Site Extended Password below for a detailed explanation on this feature). Click here for information on marking property statuses as public extended. Public Search Site Password - You may wish to add password protection to your public site. By doing so, whenever a user attempts to access your website, they will see the Log-in screen shown below, and must properly enter the password before they can see any of your site's information. To add a site password, simply type a password into the Public Search Site Password field. As with any change made to your Site Settings, be sure to click the Submit button at the bottom of the screen so your changes will take effect. Public Site Extended Password - The Public Site Extended Password is used to limit access to properties within certain statuses. Without an extended password, all properties marked with a public status will appear on your public site. You may, however, wish to limit certain properties on the site from the general public view. For example, you may not want properties with an Eviction status to display for all users to see. By adding an extended password, users are required to provide a secondary (extended) login to access those particular properties. First, as shown in the screen shot below, you designate the desired property status (in our example, the Eviction status) as Public Extended in Admin>Statuses>Property (click here for more detailed information on statuses). Second, you set up a Public Site Extended Password in Admin>Site Settings>Public Site in the Public Site Extended Password field shown in the first screen shot on this page. Third, you provide the extended password to select individuals. Now when users log in with the extended password, they gain immediate access to combo box status, location, and code for all properties, as well as access to properties marked for extended password viewing only. This is how it works: When users log on to your public site, they will see an Extended Login option at the upper right corner of the screen (shown circled below). Upon clicking this field, a Password screen will appear (also shown below), on which they will enter the password you indicated in the Public Site Extended Password field. Once they have correctly entered the password and clicked the Login button, they will have access to all Public Extended information. Note: If you leave this field blank, Extended Passwords will not be utilized. Also, you cannot create Extended Passwords for different groups of people. Any item marked as Public Extended will be displayed to any user who enters the Public Site Extended Password. Once the agent clicks the Agent Info link, another screen will appear asking for the password that you provided. After the correct password has been entered, the combo box information will appear in the same area circled in red above. Information provided includes the status of the combo box, it's code, and its location. If you leave this section of the Site Settings blank, the Agent Info section will not appear at all on your public website.